Why choose MyTub for copper coils? MyTub service is second to none in the UK, no other company aims to fulfill your requirements like MyTub does. We have fully trained and experienced staff ready to take your order, find the nearest branch with the goods ready on the shelf to deliver to your address and ensure you get your order delivered to you as quick as humanly possible. We keep you informed of the progress of your order, good or bad news. Our experienced team offer pre sales service to answer any questions you have relating to the products by liaising with the manufactures. All our copper coils products are genuine branded goods. If the item is in existence and on a UK shelf we will source it for you, in some cases when the part has even been obsolete for quite some years. Contract pricing and quantity discounts available on copper coils, our contracts department can also aid in specification if needed. Kuterlex is copper tube coated with a seamless plastics cover which protects the copper tube against aggressive materials. typical applications include cold water services and underground pipework, in ..
Kuterlex plus protects the copper tube against aggressive materials and accidental damage and abrasion. 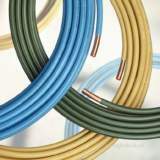 the plastic covering withstands water service temperatures up to 95°c and is flexible down to - ..
Kuterlex plus protects the copper tube against aggressive materials and accidental damage and abrasion. the plastic covering withstands water service temperatures up to 95°c and is flexible down t ..
Minibore is a small bore tube supplied in coil form in lengths up to 50m which can be bent easily by hand or using an appropriate machine. its small diameter offers the possibility of forming tight be .. This minibore 25 metre white pvc coated bore copper coil 10mm x 0.7mm mkw1025 comes from the minibore annealed coil range with an 10mm outer diameter and 0.7 wall size. minibore is a small bore tube s .. This kuterlex plus 25 meter white plastic coated copper tube 22mm x 1.2mm yk+2225 comes from the kuterlex plus annealed coil range with a 22mm outer diameter and 1.2mm wall size. kuterlex plus protect .. This minibore 20 metre small bore copper tube coil, 10mm x 0.7mm m1020 comes from the minibore annealed coil range with an 10mm outer diameter and 0.7 wall size. minibore is a small bore tube supplied .. This minibore 3 metre small bore copper tube coil, 10mm x 0.7mm m103 comes from the minibore annealed coil range with an 10mm outer diameter and 0.7 wall size. minibore is a small bore tube supplied i ..